The clinic — the subject of feature film "Gosnell: The Trial of America's Biggest Serial Killer" — is owned and operated by abortionist Dr. Kermit Gosnell (played in the film by Earl Billings). The unexplained death of an immigrant mother and unsanitary conditions at the clinic are also under investigation. 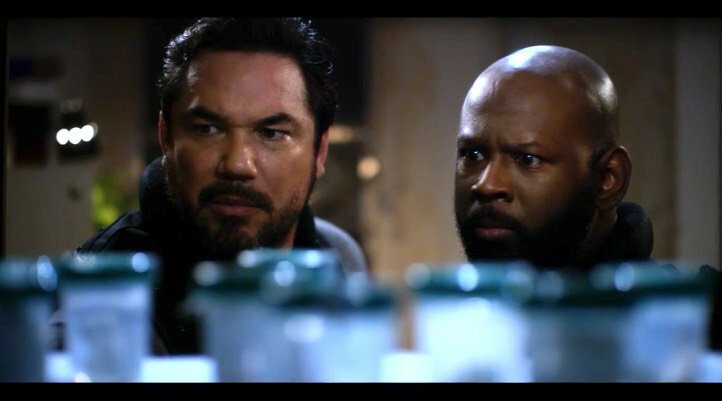 After a squabble about jurisdiction, Detective James "Woody" Wood (Dean Cain) and his partner Detective Stark (AlonZo Rachel) enter the clinic and quickly become horrified at what they see — and smell. The clinic is filthy and smells of urine. There is blood on the floor, cat feces on the stairs. The remains of aborted fetuses are stored on shelves and in milk jugs and waste bags in the refrigerator and freezer. They find jars with the feet of fetuses in them. (Gosnell explains later that he kept these in case genetic testing would be required.) Gosnell tells law enforcement they are having issues with the medical waste company. There is evidence that babies have been aborted after the 24-week gestation legal limit in Pennsylvania, and some of them had probably been viable. They discover that some of the staff is underage and not trained. Further, they learn that Gosnell would kill babies born live by snipping their spinal cords. They find seven corpses of late-term babies in the clinic. There are dirty tanks with exotic rare turtles that Gosnell keeps as pets. Gosnell loses his license to practice medicine. When Woody asks a judge for a warrant for Gosnell's home, the judge warns him to narrow the search for evidence related to the death of a patient, illegal prescriptions and illegal late-term abortions. They find missing case files in his home, cash stashed everywhere and several titles to real estate. As the search continues, Gosnell sits down at his piano in the living room and plays classical music. The district attorney, Dan Molinari (Michael Beach) is hesitant to present this horrendous case to a grand jury because he doesn't want it to become a test case for abortion, a practically toxic issue. He warns the assistant district attorney, Alexis "Lexy" McGuire (Sarah Jane Morris), a pro-choice mother of five, that she had better win this case or her career will be over. The case is presented to a grand jury, which votes to indict Gosnell. He is arrested on Jan. 19, 2011. As he prepares for trial, he tells his attorney, Mike Cohan (Nick Searcy), that he treated his patients as he would treat his own daughter and that everything he did was for the protection and welfare of women. When the trial opens, Molinari prepares his team to deal with the media that is sure to swarm the courthouse. But when they enter the courtroom, there is not a reporter in sight. It takes days for the media to show up and only after a blogger posts a photo of the empty seats reserved for press. The blogger asks why no one is covering the trial. It works; the media shows up en masse. Betty Goodwin (Dominique Deon) started working at Gosnell's clinic as a young teenager. She is also an avid photographer. She took a photo of a late-term baby from the clinic and testified that it was moving when Gosnell snipped its spinal cord. When McGuire shows the photo to the jury they are visibly shaken; some begin to cry. (The photo is only available on the film's website gosnellmovie.com, under Resources, "Baby Boy A"; there are no graphic images in the film.) Her testimony is convincing. At first, I was hesitant about seeing this film, thinking that it would be just another preachy Christian movie with a message. Instead, sometimes controversial filmmakers Phelim McAleer, Ann McElhinney and Magdalena Segieda, stay pretty close to the story and to making the film about Gosnell's crimes, sociopathic personality and creepy demeanor, rather than directly about abortion. The film states it is based on transcripts of interviews and court reports but that some parts are fictionalized. Without having read the bestselling 2017 book (of the same title by McAleer and McElhinney), I cannot tell which parts are made up, but it is defense attorney Cohan who makes the strongest case against abortion while trying to prove the defendant innocent. After a female doctor testifies for the prosecution, Cohan asks her how many abortions she has carried out (30,000) and learns not one fetus had been born alive. Cohan then projects an image of a later-term fetus in utero and holds a long needle to demonstrate how potassium chloride is injected directly into the baby's heart to kill it. He gets her to describe how brain's grey matter is removed from the baby's skull so that it can be removed through the birth canal. Cohan was trying to establish that Gosnell did not deliver late-term babies that were alive, but the horrific descriptions certainly affected the audience in the theater. I have never seen a more somber group of people leave a theater. If there is a message in the film, the depiction and description about how later-term abortions are carried out is it. Cain as the token Catholic detective does very well, but Billings (who bears an uncanny resemblance to Gosnell) gives a chilling performance of the psychopathic amoral doctor. Cohan, played by Searcy, who also directs, is the only character that I thought was over-the-top; it was as if he had to make sure the audience understood how terrible this whole story was even as he was acting for the defense. Race is also an issue in the film. Even though Gosnell is African-American, white patients were given better rooms upstairs in the clinics while women of color were treated in filthy basement rooms. Another issue is misogyny; women are not cared for but mistreated horribly. The clinic reused instruments without sterilizing them; many women developed venereal diseases after having abortions there. Gosnell carried out abortions for 30 years. Even though complaints were made to the Pennsylvania Department of Health, no one followed up. There is no evidence that Gosnell cared for the welfare of the females he treated in the film or in any online information that I could find. His actions were and remain indefensible. "Gosnell: The Trial of America's Biggest Serial Killer" is a real-life crime story that could be on "48 Hours," "Dateline" or the Investigation Discovery network. I remember the story making the news back when Gosnell was convicted, but it faded soon enough. This is not an anti-abortion film — except when it is. It is not graphic — except when your gestalt fills in and creates a whole picture of the story's elements. I believe we should know the details of what an abortion entails to educate people. Is horror an effective motivation for people to choose life? Or to convince voters to demand that the government legislate to care for pregnant girls and women so they will not seek abortion? And give assistance after the birth of the child? It is hard to know. But this is closely based on a true story, so there is a case for watching it. We see in the film that it is a child in the womb, not a lump of tissue. People can say abortion is about anything they want, but this film makes it clear that abortion is about killing, death, racism, misogyny and greed masked by a horrendous, treacherous, sick benevolence on one hand and a total lack of caring on the other when women are vulnerable and think they have no other option. I have never seen evil portrayed thus; I have never seen a horror film more terrifying than this.